Busy at working, no time to go to gym? Sit along before a screen for a long time cause fat accumulation on belly? Skin slack after gave birth to a baby? For these annoyance, this stepper is a good choice to burn fat, tight your skin, keep your heart healthy and your weight under control. What's more? Almost every dimension of cognition improves from 30 minutes of aerobic exercise, and creativity is no exception. Don't hesitate to have one! Overall size: 17" x 13" x 8.8"
Pedal size: 11.2" x 4.3"
【Excellent Hydraulic Resistance Design】Goplus Stepper adopts excellent hydraulic resistance design. It has non-slip pedals to ensure safety, you can feel an obvious resistance of climbing a mountain. In the meanwhile, its buffer and steadiness protect your knees and ankles from getting injuried. 【LCD Display to Record Calories】The informative LCD training display circularly shows time, scan, rep count, total count and calories burned during your workout. 【Height Adjustable】Heavy duty steel construction provides years of reliable use. The height of pedals is adjustable. 【2 Resistance Bands Included】Stepper training is a great cardio to lose weight all over while still building some muscle tone on the legs. With our resistance bands exercise together to have a good shape of arms, waist, belly, buttocks and legs. Just 30 minutes of aerobic exercise each day can help keep your heart healthy and your weight under control. 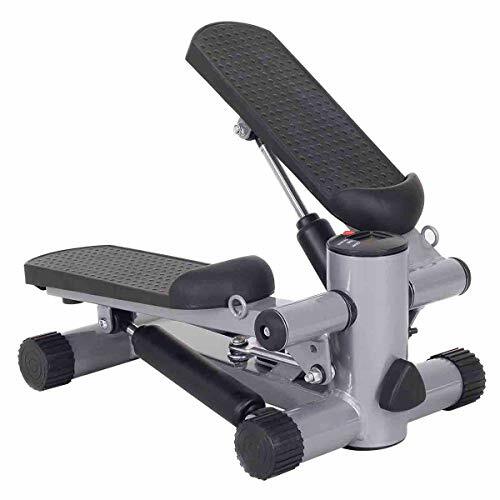 【Space Saving】The overall size of this stepper is about 17" x 13" x 9", it saves much more space than a treadmill. Also, its 16Lbs weight makes it portable to be taken to anywhere. Its weight capacity is 220Lbs.